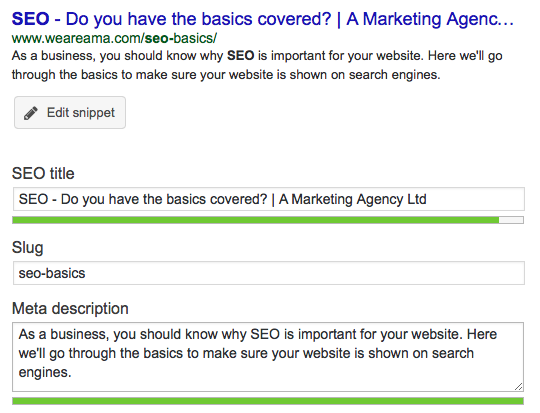 SEO – Do you have the basics covered? As a business, you should know why SEO is important for your website. In a nutshell, Search Engine Optimisation is used to improve your website’s rankings on search engines. It’s important to get your SEO right, as it means that potential customers can find your websites through the likes of Google and other search engines. We’re going to go through some of the very basic things that your website needs to rank well. Onsite SEO is the process of making your website friendly for search engines, which involves adjusting elements of your content in order to improve your rankings. The most important on-page SEO elements are your content, keywords, meta data, page titles, alt text, and links. Before you do anything, you need to ensure that your website is populated with relevant content. A blog page on your website will do the trick. This content should be useful, and contain words and phrases used by people who search for your products and services. Good content allows for others to share and link to it – which also improves your SEO due to backlinks and the fact that your content is validated by other people and websites. You could create content in the form of helpful articles, videos, infographics, podcasts and so much more. Keywords and phrases describe what is on that page of your website, and is the term that is used by people using a search engine to find a result. Your keyword may be the most important aspect of SEO, and so doing research would be necessary to get it right. Ensure to avoid keyword stuffing as this has the opposite effect on your SEO. It comes across as unnatural, and doesn’t bode well in search engines. Similarly, your keyword density shouldn’t be too high as there’s a risk of overusing said word. Your page titles may be one of the most important things when it comes to content and SEO as that’s the thing that people will read first, and determines whether they will click on through to your website or not. You want to ensure that your titles aren’t too long, and contains your keyword for that page, while making sure to avoid keyword stuffing. Meta data may be one of the most important things when it comes to SEO, because it helps increase the chance of someone clicking on your search result. Your meta description is a short description that describes your page, and should be relevant to your page title and article content. It also helps if your keyword or keyphrase is included in the description. This allows Google to “read” your image as opposed to seeing it, which increases the chances of it appearing in a Google image search. Not only this, but alt text is needed for the accessibility of your website. People with poor vision may rely on the alternative text to let them know what the picture is of. In terms of linking, it’s very beneficial to link internally throughout your website. For example, at the end of an article, you could always link to another interesting piece of content on your website, so that the audience can spend more time reading your content. Your navigation should also link to different pages to make it easier for people to move around your website. Once all your onsite SEO is sorted, you can start with offsite SEO. These are the actions you take to promote your website, usually through link building and social media. Linking to external sites shows that you trust other websites, and it may allow for these websites to do the same for you. This improves your SEO ranking considerably. The only problem with using backlinks yourself is that you’re now relying on external sources, so you want to choose websites that you trust. Have one or two relevant backlinks, but don’t overpopulate your site with them. Once your website is set up, one of the easiest ways to get your content seen is through the likes of social media. Post a link to your website, think of a relevant comment to go along with it, and get posting! It does take time and effort to create an effective social media strategy though, so prepare yourself, and maybe read one of our past blogs on the topic. So those are the SEO basics. There’s so much more you can do in terms of SEO, but first you must nail down on these ones. If you need help with your SEO, don’t hesitate to contact us!